1 1/2" x 1 1/2" sterling, brass, and copper with copper heart on side A and a semi precious stone on side B. the center of the pin rotates to change appearance from featuring a heart to featuring a stone. 2" x 2" brass heart wrapped with sterling and copper wire, enhanced by semi precious stone. 5/16" x 1 1/2". brass, copper, silver, and semi precious stones. brass top piece is held in place by the stones on either side. 1 1/2" diameter. sterling, brass and copper tubing, cutout shapes, and semi precious stones. textured surface. 2" diameter- oxidized copper each uniquely shaped to embrace a brass heart and 2 semi precious stones. 1 7/8" x 1 7/8". polished, burnt, hand shaped copper with polished copper free flow accent wire on one side. 1 1/2" x 1 1/2". sterling, burnt and frosted copper, and brass hardware. 2" x 2" copper. hand-cut, uniquely burnt, marked, frosted, polished. inspired by a pin that i made for myself on the day we first bombed Afghanistan in october 2001. my pin was too complicated to make more than once... this was a good compromise. my pin was the same design but made with mixed metals. after making my pin and then this one, i realized i needed to make something smaller to send my friends in NYC. they needed some love and protection after 9/11. sadly, the world remains unstable and this pin remains relevant. 1" x 1". copper, burnt and frosted. ( hand stamped) tac pin and nickel clutch. this looks good on jackets, hats, and bags. each comes attached to a card explaining the origin of this little pin back in october 2001, the day we first bombed Afghanistan. having lived in NYC for a number of years, i lovingly hand cut the first little pins to send to about 40 friends of mine in NYC as gifts of protectionafter 9/11. since then, i made a stamp so i can share them with people that saw it and wanted one. they are often purchased in quantity and given away as gifts. 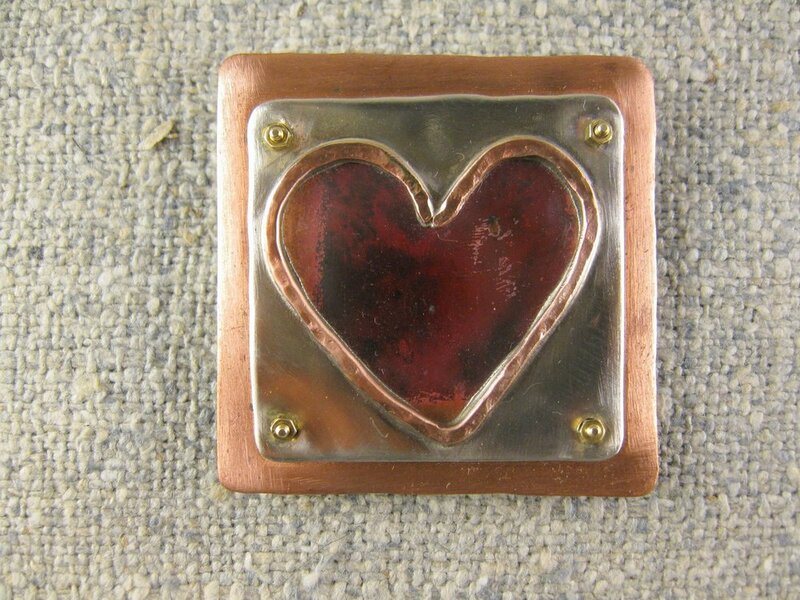 1" x 1" copper heart that is "drawn" with copper, brass, and sterling. every one is unique. tac pin on back. nickel clutch. good on hats, bags, and jackets. 1 1/2" tall. oxidized brass with copper heart. tac pin with clutch back. originally created in late 1980's as an AID's memorial ribbon. profits were donated to RideFAR. it has evolved into a memorial ribbon honoring various causes. 1 3/4" x 1 3/4". 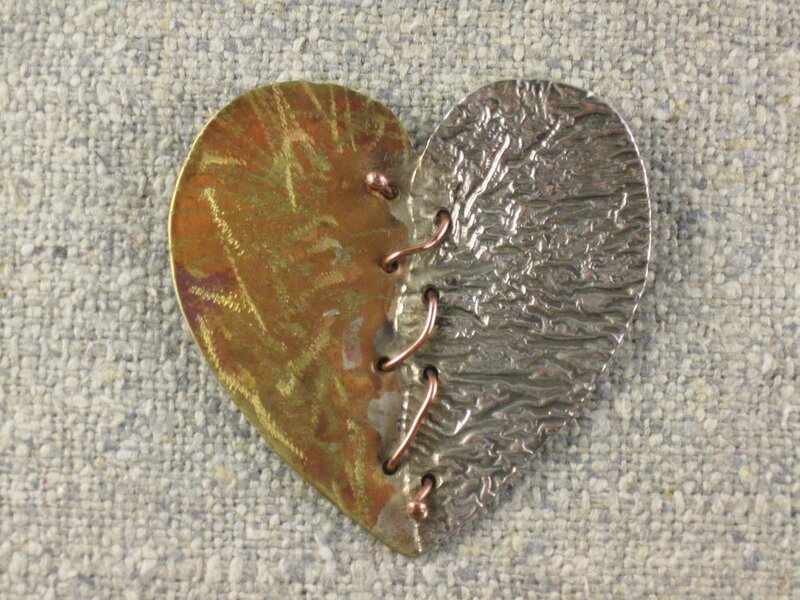 3-D. marked sterling heart , copper stitched brass slightly elevated off of a burnt copper back-plate. a number of nurses have chosen this piece through its history! 1 3/4" x 1 3/4". brass, oxidized, pleated copper, reticulated silver. 1 1/2" x 1 1/2". sterling backplate with single semi precious stone.. copper heart covered with mixed metal tubing and rod attached to plate with mini brass hardware. 1 1/2" x 1 1/2". textured sterling backplate, 3-D brass (brick wall!) 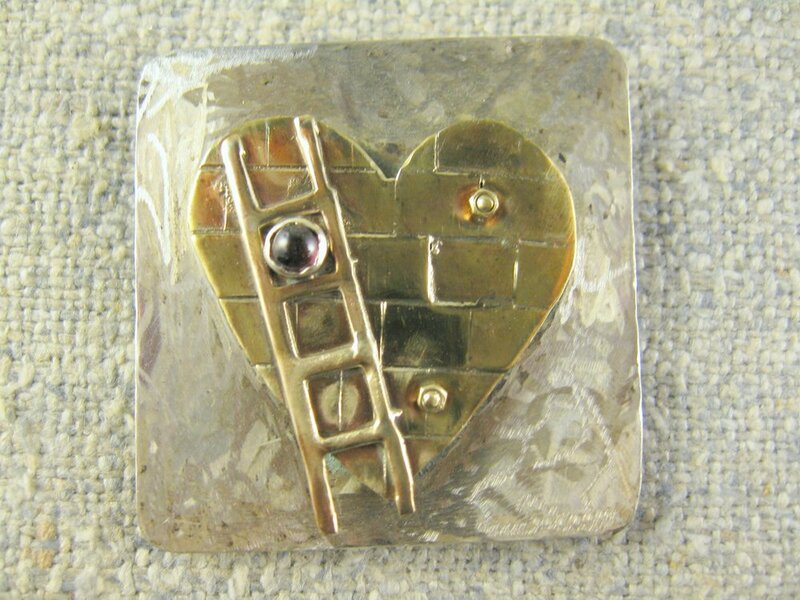 heart with mini brass ladder and semi precious stone, attached with mini hardware. 1 1/2" x 1 1/2". sterling back plate, brass screen, oxidized copper, mini brass hearts and mini hardware. marked frosted sterling back plate. burnt copper heart, marked and pierced with mini hardware. 1 1/4" x 1 1/4". frosted , marked sterling back plate. 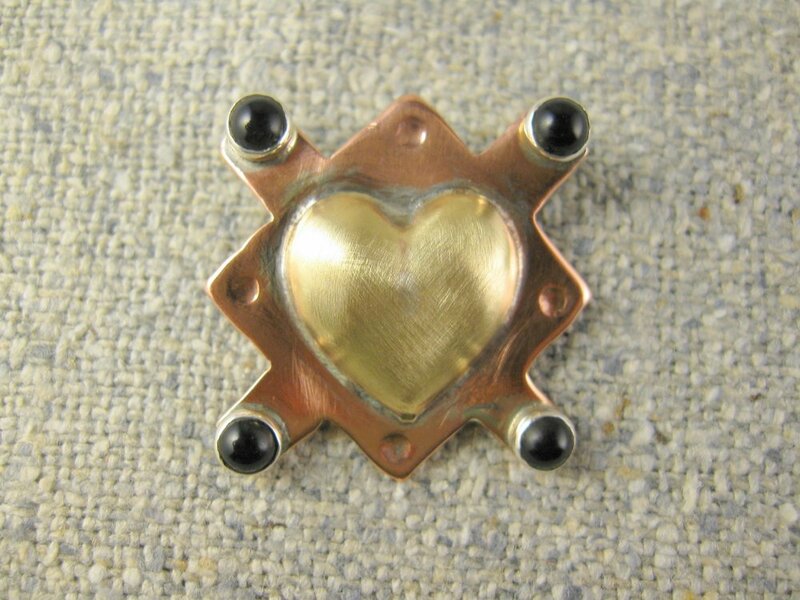 copper, brass 3-D heart, mini hardware. 1 1/2" x 1 1/2". sterling, brass, copper, mini hardware. 1 1/2" x 1 5/8". copper, sterling, 2 semi precious stones. 1 1/4" x 1 3/8". copper, brass, sterling, semi precious stone. 1" x 1" tri metal pin. brass tubing, domed sterling with domed copper heart and 4 semi precious stones. 1 3/8" from stone to stone. stones can match or be mixed. 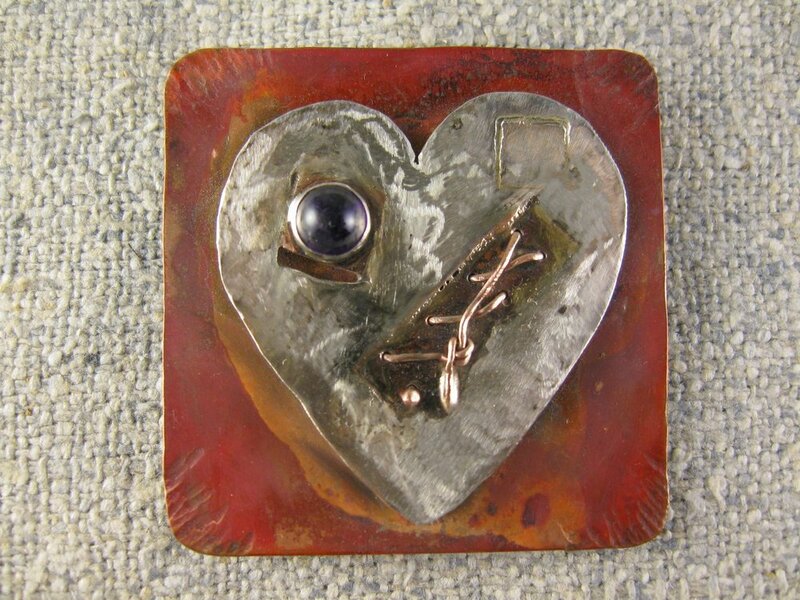 copper back plate, 3-D brass heart. 1 1/4" x 1 1/8". 3-D. brass, copper, reticulated silver. 1 1/2" x 1 1/2". 3-D. sterling, copper, brass, and semi precious stone. the two hearts are free moving yet contained together. 2" x 2". reticulated silver, oxidized textured brass, and copper stitches. 1 3/4" x 1 3/4". copper, brass, sterling. this pin, more often than not, has sold to a pregnant woman!! 2" x 1 1/2". 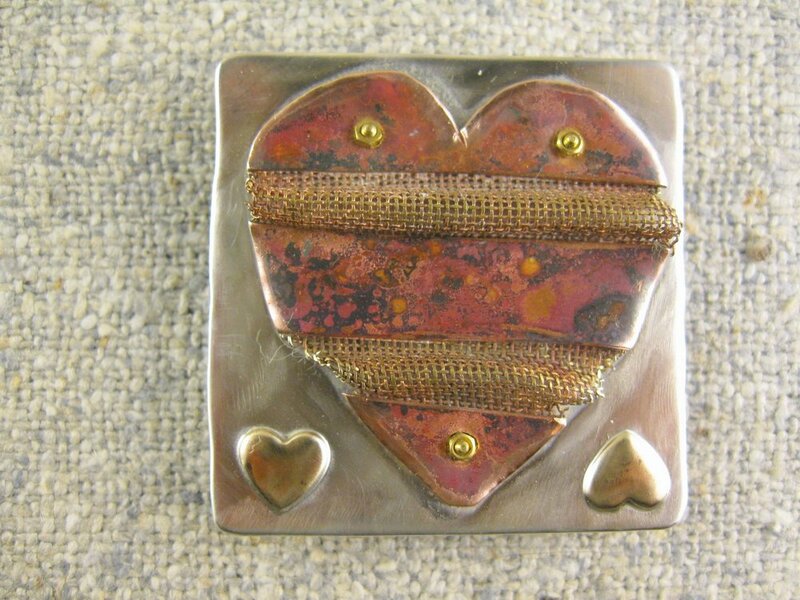 frosted triangular brass back plate with enameled unfolding copper heart. enamel will vary from piece to piece. corner enhancements. 1 1/8" x 1 1/8". sterling copper, and enamel. enamel will be different on each piece but have a similar color combo. 1 1/2" x 1 1/2" copper pin with one semi precious stone. oxidized, scratched, and frosted. strong design destined to match any outfit you wear!!! 1 1/2" x 1 1/2". heart is 3-D with woven brass wire. hammered sterling back plate, copper, and brass. side A of heart. stitched, copper, brass, burnt, marked. over all size is roughly 2 1/2" x 2 1/2". oxidized top copper bar with 4 semi precious stones-onyx and carnelian. swivel hanger allows heart to be flipped over to display side B.
this pin is meant to resemble a medal of honor! heart side B. sterling, rivets, wrapped wire, marked surface. can be flipped back to side A via brass swivel.